... Praymar, the weird little albino boy with the red forked tongue, could see better than anyone else into the darkness. He had invoked his mystic power of Night Vision. Though he was too young to be able to see terribly far, he was nevertheless able to see further than the others. He peered through the open doors of the barn into the black space of the Cartwright’s shop. Nothing stirred. He thought he could make out the silhouette of a man standing there, but even so, the outline was hard to see. In his mind, Star was answered by the resounding and clear voice of Eldrik, the magnificent Elkron of the Sun. With that Star felt a the passing presence of great strength and power move above him. He had the sense that the ‘innocent one’ was Praymar, oddly enough. That did not make much sense to him. But Eldrik’s eyes see farther than all. Perhaps there was more to Praymar than Star thought. He was now able to see into the darkness, and so peering into the gloom he saw a tall man, like a shadow, standing motionless. His arms were outstretched in a peculiar fashion, and he wore a peculiar triangular hat from which dangled a single tassel. There was something distinctly unnatural about the shadowy figure. His head was cocked to the side at a disturbing angle. Somehow Star knew that whatever the man in the shadows was, he was evil indeed. “Perhaps, this time I shall have the first shot!” said Star as he prepared to invoke the Divine Strike of Eldrik upon the shadowy figure. “Archers, through the center of the doorway – fire your arrows now!” he called. The archers, who were not able to see into the dark room, but were able nevertheless to fire at the center of the open doorway, immediately did so. Several shots vanished into the inky blackness. Several clanked off of stones, some hit wood. One of them sounded like it hit something made of flesh. But there was no other sound. It did not seem to Star that the figure moved at all, in any case. Ishcandar called upon the Elkron of the Earth to invoke a miracle he had studied while training at the Adventure Guild in Hobbington. It was called Hammer Stone, and when successful called down a crushing stone to fall upon the enemy from the sky. He chanted the invocation. It took a few moments, but the a loose rock fell from the wall above the door and landed with a loud thud on the head of the shadowy figure. The hat was knocked to the side, and crushed, but the shadowy man’s head did not seem to move at all, though his body shook from the force of the blow. It appeared to Star to have no effect at all on the shadowy man. It did not bode well, he thought. It did not bode well at all. Ishcandar could not quite tell what happened. He was worried. He was nervous. He thought they were trapped, and soon to die. He felt the need for a drink. He remembered the ring he was wearing. “I can hear you,” called Lido from where he was positioned near the stairs to the loft, even though he could also hear Ishcandar through the ring’s power. But Rothmon, he knew, would be much too far away for the ring to reach, and so that avenue of communications did not seem possible. And besides, he thought, what could Rothmon do from so far, anyway? But then they both heard a woman’s voice, speaking with a crystal clear voice in their minds. “The barn is surrounded by enemy archers,” she said, “on the south and north street, and in the allyway next to the Black Dragon Inn facing your position.” It was Golden Swallow using the ring she had earlier obtained from Rothmon to communicate with the Hobbits. She was delighted it worked so well. But she had to be careful not to use up its power as the rings possessed only a limited amount of mystic energy. “So we’re completely surrounded by archers!” cried Ishcandar as his eyes darting through the open barn doors towards the Black Dragon Inn. He could not see anything across the street, as it was pitch black outside, too. 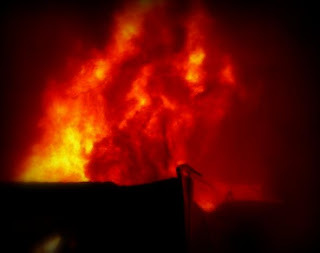 The only light was coming from the burning wagon that had crashed into the far side of the barn. It all annoyed him greatly. A nice swig of brandy would have been just the thing, he kept thinking to himself. The yellow paper with the red script that had attached itself to Praymar’s back began flapping wildly. He felt a sudden pull towards the dark opening where the shadowy man was still standing with his arms outstretched towards him. It was an odd feeling, almost as if a wind were blowing him from behind towards the dark figure. He was wounded, and struggling. He stepped forward with his right foot, and then stopped himself. “Praymar!” said Star, seeing the albino lad take that step forward. “I’m not laughing at you,” said Star with his most stern and august tone. He then began to pray to Elkdrik in an attempt to remove the piece of paper that was adhered to poor Praymar’s back. Smoke, fire and chaos was filling the air. Outside enemy archers stood ready in the darkness. The open doorway through which they stared into the Cartwright shop was as black and ominous with silence. “Have her create a distraction outside, then,” said Hermel calmly, tilting his head to the side and wondering if any dirt had gotten on his cape in commotion. It was a little too dark to be sure, but he thought he saw what might be a smudge. Lido crept over to Ishcandar, and gave him Hermel’s instruction. “Oh there’s a distraction out there already, don’t worry. But ok, I’ll do my best,” said the woman’s voice. Ishcandar, never to be distracted for long from his true purpose, asked her if she could possibly bring him a drink. “Brandy would be fine, but in a pinch I think Gin might do just as well, to be honest,” he said. She didn’t answer. Lido slapped him on the side of the head. At this point Arik and Bantum had dodged into the dark room on the far end of the barn where the wagon was burning. It was very hot and smoky there. They began searching the room for Dr. Chickenhiemer and Turkenator. It was quite dark, but the fire cast enough light into the room for Bantum to see at least a little bit. Arik, being a Dwarve had natural low-light vision, and could see reasonably well. The went after the turkey first. Turkenator, for all his faults, was a wily bird, and not easily caught. He dodged left. He dashed right. He scuttled between Bantum’s legs and made a short flight over Arik’s head. Chickenhiemer was pecking at the wall. Turkenator was giving him cover. “Almost there… almost there…” clucked Chickenhiemer as Arik and Bantum blundered into the room. “Common you dumb chickens!” cried Arik. “I don’t know why we’re carrying you around with us anyway,” he demanded gruffly as he dashed after Turkenator and bumped into Bantum with a thud. “Almost there… almost there…’ clucked Chickenhiemer to himself, entirely absorbed in his work. Turnkenator did another razzle-dazzle maneuver to try to distract Arik as he came closer. It worked and Arik ran right past Chickenhimer, giving him the few seconds he needed to trip a hidden switch in the stonework at the base of the wall. Suddenly and silently a stone door slid open. Chickenhiemer, elated, dashed through. The door slid silently closed behind him. He was in. “I don’t know why we don’t just toss these stupid fouls into the fire and be done with it!” yelled Arik. “Come over here ya dumb chickens!” Bantum was not having much luck cornering Turkenator either. The turkey mocked them both, gobbling delightedly. In his frustration Arik began kicking at the wall where he thought he had caught a glimpse of Chickehiemer out of the corner of his eye. He banged his boot hard against the stones. There was a click. It sounded like something had been triggered. The stone door slid silently open. “What the hell?” said Arik staring into what appeared to be a square black hole heading downward into darkness. Chickehiemer had already made his way far long into the corridor. Arik let his eyes adjust for moment and saw to his surprise, and one might say great satisfaction, that he’d discovered an escape route. There was a tunnel, smooth and clean, that made its way downward at a fifteen-degree slope. Not bad! Maybe chicken’s weren’t all bad after all, he thought begrudgingly. “Well of all the … you don’t say… there’s an escape route here!” exclaimed Arik quietly to Bantum as he scrambled back out of the room to go tell Hermel what he found. Coming to where Hermel was standing as he marshaled the archers, Arik told him he found a secret tunnel below the barn. Hermel, who was surprised by nothing, shrugged as though he expected that all along. “Ok you archers! Listen up! I want you all to follow my lead! Understand!? Follow my lead!” he yelled pointing his finger to Arik and then to the doorway. “Any stupid archers among you who can’t follow my lead are welcome to get confused and die in the fire!” he added for good measure. This in fact annoyed the two Dectalion Captains, whose job it was to marshal their archers. But they’d managed to bungle things thus far, and Hermel no longer had confidence in them to be the kind of emergency leaders he needed to ensure everyone’s safety. Therefore, he took it upon himself to marshal the men. 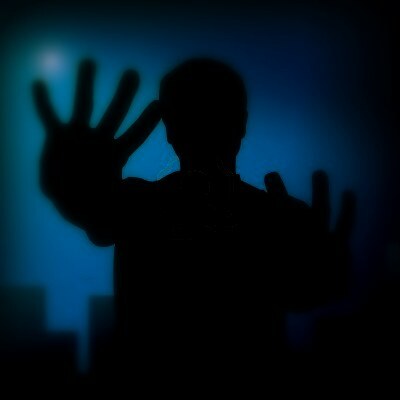 Star and Praymar, meanwhile, were peering through the Cartwright shop doors using their power of Night Vision. It was still murky and dark. Far too dark, thought Star, who had some experience with such matters. In fact it seemed that a wholly supernatural darkness had descended on the entire scene. And then something unexpected happened. “Come to me, Praymar. Come to me,” heard the young albino in his mind. The sonorous voice, he knew, came from the shadowy man standing motionless in the shop ahead. He felt a pull towards the man, as though a strong wind at his back were pushing him toward the doors. The yellow paper fluttered wildly at his back. “What do you want from me?” called Praymar mentally, his own voice sounding quite rich and deeply toned, and echoing magnificently. This was Praymar’s inner voice. The one that he always heard. Not at all like his ridiculous squeaking outside voice. “Come to me, Praymar and learn of your Destiny,” said the sonorous voice. “Come to me, Praymar… and learn your Destiny,” said the voice. Now this statement in fact intrigued the weird little albino boy. He always had felt that he had some special destiny because he was born so different from others. Why else, he had thought on many occasions, would he be the only one with white skin and hair, and red eyes, and a forked tongue? He must be destined for something, he believed. And furthermore, from the reaction of the others when they were in Hobbington that night of the lightning storm, something very strange and awesome must have happened to him. He could not remember it, but the others all had looked at him with expressions of awe. Again, he felt that it was all related to his special destiny somehow. He now wanted to walk forward. But darting a glance towards the open barn doors, and remembering the enemy outside, he held himself in check. The wind blew at his back, but he held steady. Star looked at him from the side. He had an awful bad feeling about what Praymar just said. With that Praymar dashed forward and leapt to the other side, passing through the enemy fire zone where the Brigand archers could shoot at him. Lee did a somersault and also leapt to the other side. A number of arrows thunked into the wall on the far side of the barn. Neither of the heroes were hit. Lee took up a position on the far side of the double doors. Outside there was a loud and terrifying sound. Something that made a noise reminiscent of an enormous cat-dragon-pig... or something far worse. It roared so that echoes reverberated throughout Harrowsgate. The strong smell of sulfur wafted into the barn from outside. No one liked having heard that sound. No one. Yet Star put his mind to the task at hand, planning to invoke the miraculous Eldrik Power known as The Divine Strike on the shadow-man in the Cartwright shop. “Eldrik, thy will be done!” he said as he prepared the mystic invocation. As he chanted the invocation, the Solar Spirit of Eldrik entered him, perhaps through the firelight of the flaming wagon, which was burning in the doorway on the far side of the barn. And yet, to Star’s great chagrin the Divine Strike was not fulfilled. When he finished the invocation, nothing happened. A dud. He was enormously perplexed. He almost felt the Elkron smirking at him. Praymar, now on the other side of the line of fire, stood staring into the darkness of the Cartwright shop. The darkness was so dense Praymar knew at that moment that it was unnatural. Even so, he could see well enough to make out the shadowy figure standing in front of an old beat up wagon with a broken wheel. He looked vaguely familiar. Then he remembered him. It was the man who had been in the coffin back when they fought the mysterious Fifth Animal on the road to Lilac Village! Praymar remembered the exhilaration he’d felt tearing the yellow paper from the corpse’s face. Now he began to regret his misdeed. It was a very fooling thing he had done. “Wow! Talk about cowardly!” commented Praymar over his shoulder. His little forked tongue flicked out a few times sarcastically. “I tried to smite it with Eldrik’s Divine Fury just now, but nothing happened! Get away from it!” yelled Star. “Not surprised,” murmured Praymar over his shoulder as he rolled his red eyes. Eldrik, hidden somewhere from the sight of mortals, amused by the comment, smiled to the other Elkron. Praymar had a way of saying things that were true, and annoyingly so. It was a trait that happen to amuse at least some of the Elkron. They enjoyed watching this party of Adventurers from Hobbington after all. “You need to get over here!” yelled Star vehemently. Just then, outside in the street the bizarre roar was heard echoing against the stone buildings once more. It sent a chill up and down the spine of every mortal soul who heard it. It was the kind of sound that did not come from the mortal world at all. Everyone who heard it visibly shivered. “Are you quite sure you don’t know where my flask is,” asked Ishcandar of Lido. “I really don’t drink that much, actually. I certainly don’t drink nearly as much as my father,” retired Ishcandar. “An elephant doesn’t drink nearly as much as your father,” answered Lido. Meanwhile on the far side of the barn, Bantum had caught Turkenator, and was holding him in his arms. He wandered into the hole that Arik had discovered. He could hear Chickenhiemer clucking far ahead of him, and so he walked blindly down the tunnel in that direction. “Chicken! ?” called Bantum repeatedly as he walked into the blinding darkness. He followed the sound of Chickenhiemer’s clucks. And so Bantum disappeared down the rabbit hole alone. At Hermel’s command the leaders of the two Dectalions of archers grabbed torches and were leading their men past the burning wagon and into the tunnel room. The stopped at the entrance and peered into the darkness. They could hear in the distance Bantum calling after his chicken, so they knew at least that immediate death was not involved. Nevertheless they waited until Arik arrived, followed by Hornmel and the monks. Ishcandar and Lido followed up in the rear, and Ishcandar stopped by the door of the room to look behind him and see how things were progressing with the battle at the Cartwright’s Shop door. He watched as Hermel strode towards where Praymar and Star were standing, and stopping just at the edge of the enemy archer’s fire zone. Hermel took up a position next to the stairs that went up to the loft, and cocked an arrow. He didn’t care to cross the fire zone, but he was perfectly ready to shoot anyone who entered the barn. 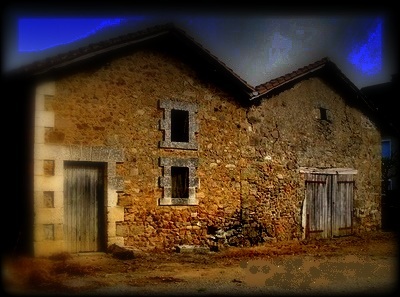 As it was the four archers he had ordered to be ready with their torches were in position just next to the barn door. “The rest of you archers, follow my lead!” shouted Hermel to the remaining archers who were still in shooting formation facing the burning wagon. As it was Hermel no longer expected any forces to enter that way, unless they happened to be made out of fire. When the archers looked at him he pointed his finger toward the room where the tunnel was found, and they all nodded agreement and began heading in that direction. Hermel then quietly uttered a chant under his breath. He planned to create an illusion of his voice issuing random orders to the archers telling them to go to different locations in the barn and take up positions there. This, he calculated, should confuse the enemy and delay any assault on the barn while everyone made their getaway down the tunnel. This was probably a very sensible plan. Hermel took the gambit, and chanted off the Illusion Spell. Unfortunately, it did not go as planned. As he uttered the final mystic word of the spell a fleck of hot ember floating on the smoke laden air landed inopportunely on his right eyelid causing a sharp searing pain. This was probably the unluckiest moment of Hermel’s short life. The spell fumbled. He was really having a bad day. The barn began to fill with the sounds of Hermel’s voice barking commands at random in every direction. Small sparks of green lightning began flickering around his feet, and then one flicker climbed up the wooden post up to the loft, while another landed on a rake leaning against the wall and knocked it over, while another darted along a window sill creating green smoke. It did not bode well, thought Hermel. No, it really did not bode well at all. Star, meanwhile, was hearing voices of his own. In fact it was Eldrik’s voice in his heart speaking to him. “Battle the foe,” said Eldrik. He thought about it. What Eldrik seemed to be saying was that he should forgo attempts at miracles such as Divine Strike, and charge the foe with his strong right arm and smite the shadowy man… physically? Star gave out a big heavy sigh. His most effective attack was Divine Strike. He knew that. Eldrik, he thought, knew that. This seemed like an ill-considered instruction, possibly. He was evaluating it. “Well, I have to admit,” he thought to himself, “Divine Strike has failed every time I’ve tried it recently.” He thought some more. He felt the menace of evil in the darkness of the Cartwright’s shop. He paused. He sighed again. Those how might cast uncharitable aspersions at him might have suggested that he seemed immobilized by fear. He face took on a confused and befuddled appearance. Poor Star. This was a bit much for him. “It would seem your Star is falling,” said the dark Elkron Obitus to Eldrik. “Oh, shut up,” replied the Elkron of the Sun, though perhaps not in quite such terse terms as that. The Elkron are typically very polite to one another, almost as if they really were simply members of some super-celestial philosophic debating society. Well, on a good day, anyway. The Elkron of the Sun looked sternly downward. Star was not one of his most promising Warriors, perhaps, but then again, he had done well on a number of occasions. And it did seem that some particular strand of Destiny was riding on his ability to overcome. He would, Eldrik, hoped, do well after all. Maybe. He whispered his encouragement downward to Star’s wavering heart. Star took heart in the fact that the enemy outside fumbled their shot. There seemed to be a lot of that going on lately, but at least it wasn’t only their own group beset by bad luck. He skidded to a stop outside the Cartwright’s shop door and stood panting next to Praymar. It was murky darkness within, but he could now see the shadowy man more clearly. 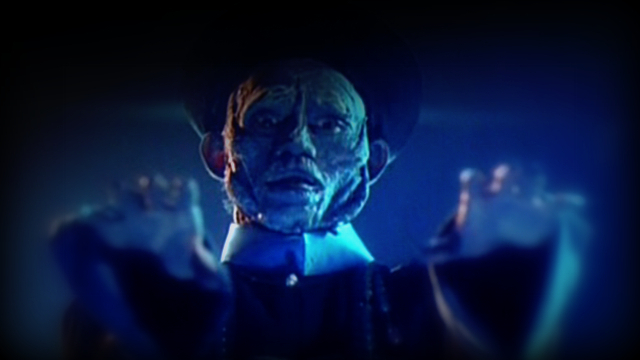 He stood in a long dark blue robe, wearing a strange triangular hat with a single golden tassel draped over the side. His skin was very pale; there were open wounds on his face. His neck hung his head at an odd angle. His arms were outstretched towards Praymar. “Restless spirit, what are you doing here?” asked Star. “I have come for Praymar,” said the shadowy man. “What is his Destiny?” asked Star. “It is for him to know, …not you,” said the shadowy man with the finality of the damned. Praymar, for his part, was now feeling more eager than ever to learn of his Destiny. This had gotten exciting. But he was sore afraid, too. What if he went with the accursed shadow-man and things didn’t go well? What if it was a trick and a trap? What if it was revenge the shadow-man thirsted for after all? He wavered. He wanted to learn of his father, and his Destiny more than anything in the entire world. But maybe not today. The yellow paper was still attached to Praymar’s back. It was flapping wildly in the non-existent wind. Star reached over and tried to pull the paper off his back. When he did Praymar felt a searing pain. He screamed for Star to stop. Apparently the yellow paper was stuck to him pretty darn good. At Hermel’s order, the four archers threw their torches outside the barn door in a wide pattern, and then following his lead, retreated backwards and ran through the smoke toward the room where the others were gathering. Outside, where the torches landed they seemed to give off far less light than one would have expected; the light they gave off only illuminated four small circles around them. In the dim light of one, Hermel could see Lido’s backpack was laying the ground where Ishcandar had thrown it. It began writhing, and stretching into strange contorted shapes … something … was coming out of Lido’s backpack. First, a large cat’s paw pushed itself out of the mouth of the backpack. It then dragged the rest of itself out. Smoke in a thick yellowish-green cloud billowed out suddenly from its gaping maw. On the ground in front of the distorted leather bag sat a cat; yet it was not in the least bit like a normal cat. For one thing, it was quite a bit larger than a normal cat, and strangely deformed, half hunched over its front legs which were of different lengths, one ending in a larger than normal cat’s paw, while the other ended in a lizard’s grasping talon. It’s rear end looked like a coiled serpent, perhaps. Down its back was a ridge of bony spines. Where portions of its fur was missing, and had grown in rough gray scales like a dragon’s. It hissed horribly, then roared, and a green vapor billowing from its mouth. The sound echoed bizarrely throughout the stone buildings of the Harrowsgate. Those who heard it, wanted desperately to flee as far away as possible, and many of them fled the village that night, never to return. It roared again with a bone chilling echo. A blue tentacle emerged briefly from its left nostril, licked the air, and then returned. The thing was utterly loathsome. Suddenly the cat appeared in front of Hermel in a flicker of green lightning, which shimmered around the cat’s horrible edges. It looked at least as surprised as Hermel, and darted its eyes around momentarily before fixing them on Hermel. These were eyes of ice and fire. Strange, hypnotic, dreadful eyes. And they looked directly into Hermel’s soul. “Yup, this is not a happy cat,” thought Hermel. The cat-creature roared. The horrible sound mixed in with all of the sounds of Hermel’s orders throughout the barn echoing madly against the walls and rafters. Even the fire on the wagon quavered at that hell-begotten sound. The voices all seemed to merge into one horribly unintelligible and supernatural caterwauling. The sounds of Hermel’s commands seemed then to be coming from the cat itself. It opened its mouth and out came Hermel’s voice, supercharged with supernatural horror, ordering the archers to do terrible and random things. “Bob! Quickly, shoot Brian!” was heard. “You there! Shut the window with your head!” came next, echoing horrifically. “Barnabus! Shoot your arrows into the fire!” Hearing these commands, some of the archers began to quail. Some began to run around in small circles. Some, the more stalwart of them, forced their feet to take them as far away as they could, into the tunnel room, and down the dark hole where Bantum had gone. These men were driven. And so the barn, rapidly cleared out. Only a few of the weaker minded archers remained, some trying to follow the insane orders, others laying on the ground quivering in fear. Fortunately, on the whole, the archer Dectalions were ranked with men of fiber. They were not ignorant of the ways of magic, and were familiar with the wiles of the supernatural. They dodged. Hermel flashed out his sword and struck at the beast. However, despite his best effort the creature was unfazed, and lightly dodged the blow with a twist of its deformed body. The cat again opened its mouth and out belched a green gaseous cloud. The smell was beyond imagining, and instantly nauseating. Hermel desperately wanted to make his way up the stairs to the loft and hide in the shadows. Whatever this cat-creature was, he decided, he wanted less to do with it than nothing. He bolted away as fast as he could. As this was happening Star was facing the shadow-man, who waved its fingers suddenly at his Star and uttered dark and accursed words at him. Whatever it was, however, Star warded it off with his upheld hand, and a fervent prayer to Eldrik. The creature, having failed to harm the Warrior Priest, turned his attention back to Praymar. “Ben is my father!” shouted Praymar. With that, Star stepped forward with his morning star and struck at the dreadful man with the outstretched arms. “No wait!” yelled Praymar to Star, so deeply wanting to know the answer to this riddle, and tugged at Star’s arm. The morning star went astray and whizzed past the shadowy man’s head, missing it by an inch. The lurker in the dark stood motionless, his outstretched arms pointing toward Praymar. “I want to know who my father is!” yelled Praymar. “But why would he lie about that?” squawked Praymar uncertainly. “Because he’s haunted by evil power! Why would he tell you the truth! ?” shouted Star. “So he can corrupt you! He wants you to go to hell with him! Perhaps to drain your soul, or do bad things to you, or make you listen to bad music!” cried Star at the top of his lungs. “Bad music!? Agggahhh! Nooo!! Not bad music! !” shouted Praymar with a terrified squeak. He was persuaded by Star’s warnings. He stepped back away from the shadow man. On the far side of the barn, Arik lead the archers and the others down a long black corridor. It sloped downward, and he noted as they went that the tunnel had been bored through solid granite. That was impressive. The walls were smooth, and the tunnel formed a solid perfectly square corridor. It was possible, he thought, that the tunnel was a trap. He half expected them all to die suddenly down there. If this were Dwarven construction, of course, he would have known for sure. But as it was they simply had to take their chances. The archers carried torches to the front so Arik could take a careful look at things. At the bottom of the corridor was Chickenhiemer, clucking quietly to himself. The chicken was standing in front of a huge metal door, studying it carefully. It had a round wheel at the center, and from that emerged four long metal bolts that went into the floor, ceiling and both sides of the door. It was reasonably clear that turning the wheel would open the bolts. Arik studied the door in minute detail, but saw no indication of a trap. Had Arik believed enough to ask Dr. Chickenhiemer his opinion, and known more Chickenese than Bantum, he might have learned that the design of the corridor, and the door, was of Late Period Varincarnian construction, and probably constructed as a passageway into far older ruins. This, thought Chickenhiemer would explain the solid nature of the door, and the bolt mechanism, which allowed it to be securely sealed from the outside. When ancient ruins were involved, he had found, it was best to be able to firmly seal the entranceway. He was quite certain about that, actually. As it happened Chickenhiemer was present long ago when the Varincarnian Noble, Prince Harkule, had discovered this segment of the ruins at Harrowsgate. The leaders of the Varincarnian Resistance Forces were busily expanding the underground defenses of what in those days was known as the Node 7 of The Orion Complex. Having uncovered some ruins while excavating the fortress, they began discovering artifacts. Indications from elsewhere in the Hobbington valley had caused the Varincarnians to believe that a temple was located somewhere in the vicinity. One, the imagined, with a vast treasure. And more importantly, if they were correct, an ancient trove of super weapons and armor. Unfortunately, although Chickenhiemer had been brought thus far on the adventure, it was at that time that the Prince had become a bit peckish, and asked for supper to be cooked before they proceeding forward into the now exposed far tunnel. The cook, a wily and mean spirited villain named Rodgier, if Chickenhiemer remembered correctly, grabbed him out of his coop and was preparing to cut his throat and throw him into the boiling vegetable pot. And so it was that Chickenhiemer made a narrow escape that day, much to the cook’s chagrin, and fled craftily away to report this information to the other members of the High Council of Animal Kings. But that, of course, was long, long ago, and what happened after that is the subject of another story entirely. All that Chickenhiemer knew was that they must have uncovered something dreadful enough to warrant building that rather magnificent door. He was not surprised. Arik looked out into the darkness beyond the door. One of the archers held up a torch. He was looking across at a wall, and craning his head forward a bit saw that there was a corridor stretching out to the left and right, vanishing into inky darkness. There was the sound of dripping water echoing from some distance away. The corridor smelled fetid, and unpleasant, as if there had been something unpleasant growing there for a long time. The air was moist, almost steamy. He noticed that the walls and floor were covered with patches of wet lichen, and in some places a thin moss had developed. Beneath the lichen he could make out designs on the walls, but they were hard to see, and he couldn’t make much sense of them. The ceiling was an enormous mass of dangling cobwebs. Despite the thin layer of overgrowth, the corridor, he noted, was fashioned of beautifully wrought stones cut and positioned with a fine degree of precision, but he could not make out the composition of the stones. The blocks were large, some weighing several tons. The floor appeared to be one solid shelf of granite, down the center of which had been inlaid a long line of jade bricks, about six inches by eight inches, that vanished off into darkness in both directions. “Well, well, well,” said Arik. “Now this is mighty interesting.” Everyone else was awestruck and silent. All except Dr. Chickenhiemer, that is. With a cluck, he suddenly leapt into the corridor and clucking frantically flew off into the darkness to the right side and disappeared. Bantum immediately ran after him. “Chicken! Mr. Chicken! Come back! Come back Mr. Chicken!” he yelled as he loped off down the corridor. Arik, shrugged, cursed, and motioning for the others to follow, and ran after them. When going down the rabbit hole, perhaps it is better to just keep going after all. Perhaps. Meanwhile, upstairs, in the barn, half of which was becoming an flaming inferno, the battle of the Cartwright’s Shop raged unabated. A thousand commands from the hell-cat shrieked through the barn with Hermel’s voice, echoing madly. Hermel looked back towards the door where Arik had lead the others. That area of the barn was shrouded in thick smoke, the flames from the burning wagon now licking upward towards the rafters of the barn. The embers were flying onto the bales of hay on the far end of the loft. It would soon be ablaze. Hermel considered trying to do an end run around the cat-monster, but it suddenly seemed too large, too terrifying, and too bizarre for him to get past. He darted his eyes around looking for another option. There was the stairs going up to the loft. Although that area of the barn was now shrouded in smoke, he decided to make a break for it and dash up the stairs. He forgot that there were archers outside the barn with a view of those very stairs. The monstrous cat was directly in front of him, locking eyes with him dreadfully. He needed a plan of escape. Hermel dashed up the stairs amid a flurry of arrows that thunked into the wood behind him as he ran. He was at the top of the stairs, and leaped into the shadows of a pile of hay bales. There was a lot of smoke up there, and Hermel began to feel his eyes stinging, and his breath became rasping. The cat monster came to the top of the stairs and stopped. An arrow had hit it, and it began pawing at the shaft. It gave out another horrendous roar and that echoed and echoed and echoed as the creature slowly vanished in a shimmering glow of green lightning. And with it the voices of Hermel issuing random crazy orders around the barn dissipated and ceased. And so ended the illusionary fumble. Hermel slumped to the wooden floor of the loft in relief. The entire thing, he realized, had been an illusion. At the same time as this was happening, Star and Praymar were facing off against their undead enemy, who in fact was not an illusion. The zombie turned his upper torso with a short hop, and swung his two outstretched arms towards Star’s head, and struck Star’s iron helm with a resounding clang. Fortunately, this sort of attack happens to be just what iron helms are for, and so Star’s brains where not splattered across the wall that day. “Praymar,” yelled Star, a little bit stunned from the blow, “help me defeat the enemy! Once we beat it, we’ll make it tell you who your father is!” Praymar, who had been seriously wounded by an arrow shortly before, and had been clouted pretty hard earlier by the enemy monk outside the barn, paused to think about that. “I don’t know if that’s a good idea,” replied Praymar pointing to the arrow in his leg. Praymar, seeing Star in trouble, decided to help and reaching forward tried his mystic Draining Power against the zombie. Now most people who know much about this sort of thing might have advised him against it, as zombies are undead, and that the rules of magic and damage pertaining to them is askew. At any rate it was certainly a risk. But Praymar, suddenly seeing that Star was useless, was determined to help his friend after all. He stretched forward with his white fingers. Unfortunately, he was unlucky and fumbled. He tripped on the rock that had fallen from the ceiling earlier, and instead of striking the zombie with his Fingers of Draining, he fell forward directly into the zombies outstretched arms. It was embarrassing. “The dice are loaded against me,” thought Praymar. “What the hell!” he squeaked, and with that the zombie grimly latched on to his arm and began to fade into the netherworld, pulling Praymar down with him. They both began to fade away. Star leaped forward to try to grab Praymar and pull him back from the depths. There was a tug of war. Praymar’s left arm was being held by the zombie. Praymar’s right arm was being held by Star, who pulled with all of his might. Praymar felt as though he was being ripped in half by two indomitable forces. “You want to know who your father is… don’t you?” said the zombie, tempting the young albino to let go of the upper world and come with him willingly to hell. “Frankly, I don’t give a damn!” squeaked Praymar, having fully decided to side with Star after all. But the zombie was stronger. He was pulling Praymar down to hell with him. They continued to fade away together. Praymar’s life began flashing before his eyes. It wasn’t that great a life, actually. Star felt that if he continued to hang on to Praymar he was in jeopardy of falling over the edge of the abyss and into hell with them. That would be a bad ending, he thought. “Eldrik! Help me!” cried Star. “Strike Star! Strike with all of your might!” came the resounding answer echoing throughout his mind. He hurled has morning star at the receding foe. Again the morning star whooshed past, missing by an inch. He struck again desperately. The zombie and Praymar were now almost completely vanished. It was his last chance. This time, however, the morning star caught a glint of the fire raging on the other side of the barn, reflecting off of the polished metal of the chief most prong of the metal ball. He felt the Spirit of Eldrik come upon him and envelope the weapon with a golden fire as the morning star struck the zombie directly on the top of his head. There was a beautiful golden flash of light, and the zombie fell backwards, his splattered skull burning with red-hot embers, a horrible shriek on his torn lips. Backwards he descended, and vanished into the shadows, letting go of Praymar suddenly. The odd little albino boy leaped away from the edge of darkness and landed next to Star, who was panting and on one knee with the effort he had put into that final blow. As the zombie fell backwards into the darkness, at the same moment, the hellish cat also vanished from wherever it was, and with a flash of thunder and a sulfurous cloud, its dread voice was heard echoing far into the night. “Bo Chu! You belong to Hell now! 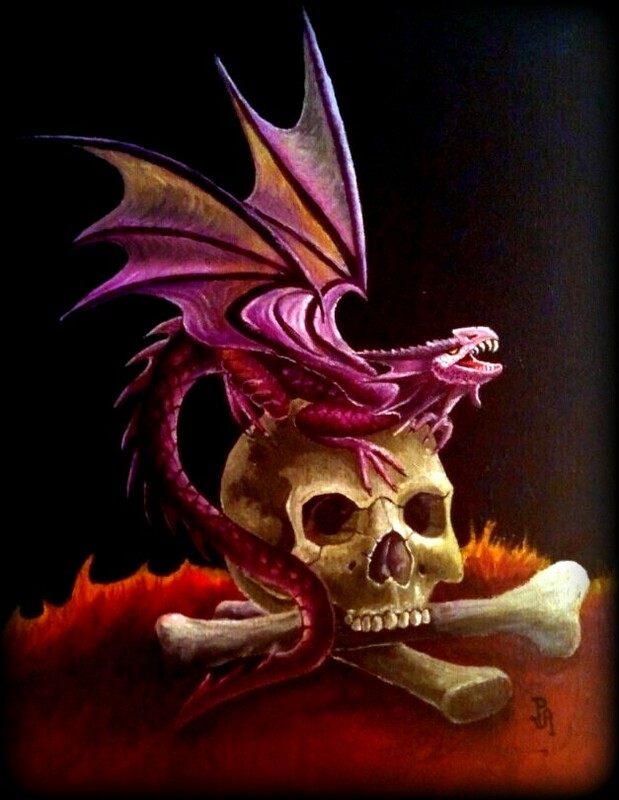 There is no escape for you evermore, but in the dread halls of the damned you will spend eternity!” said the horrific cat-dragon-pig, as it faded into black nothingness. And with that yellow paper with the red script on Praymar’s back suddenly flew into the air, caught on a gust of wind, and flew over his head and into the Cartwright’s shop where it landed squarely on a the lid of a black wooden coffin resting on the old broken wagon there. And there it adhered itself, fixed for all time, a silent and enigmatic marker of the price to be paid for a life of evil. This is an oil painting on canvas that my dad painted this for me as a gift for my birthday. … It was a dark and evil night. A bitter wind blew through Harrowsgate, banging nearyby window shutters and whistling hauntingly through the roof beams of the remote mountain village. The only light in the vicinity was coming from the flaming hay stack in the mule barn, where our heroes were frantically organizing their effort to put it out under Hermel’s calm, decisive, albeit somewhat petulant, leadership. The barn was beginning to fill with smoke, and so it was getting hard to see, and for those nearest the flames, hard to breath. Hermel ordered the archers to line up in their ranks, defend the two exterior doorways, and sent a group of six to try to smother the flames under the heavy wool blankets they had been using for bedding. Fortunately for them, it had been raining the past few days, and so there was a general dampness in the air. Unfortunately a side effect of that was the production of thick choking smoke, and crackling sparks that floated in the air from burning hay. The voracious fire had already leaped onto a nearby haystack from the pool of fire that had formed where the torch had landed, and was hungrily consuming it while looking for it's next meal. Chickenhiemer, who knew something of these things, recognized the fire right away, and clucking frantically, scuttled himself and Turkenator into a small stone room on the side of the barn. It was a temporary haven, but self preservation was not actually chief on his mind. Something puzzling was going on in that room and he wanted to investigate it. Turkenator was happy to assist, also recognizing the fire as a particularly voracious breed. He scowled as he leaped into the dark room after Chickenhiemer. The fire mocked them with a hiss, crackling sparks high into the air, and began it's attempts to leap onto another hay stack towards their position. This was an angry fire. Bantum, concerned for his little friends, went to find Chickenhiemer and Turkenator, and followed them into the dark corner room. It was very dark in that windowless place, and Bantum had difficulty locating the two busily pecking fouls. They were clucking and gobbling away while working frantically at the floor along the northwestern wall. Yes, there was definitely something odd going on, and this time Chickenhiemer was determined to find out what. Outside Arik put his back to the wall and unhitched his ax. He watched the large double doors along the tall and wide western wall keenly in expectation that the enemy would soon bash through one way or another. On the eastern side of the barn, Star stepped out from the stone stall where he had been brooding, and watched the open doorway through which he gazed into the indecipherable darkness. Outside, somewhere, he knew there were shadowy Brigands. He had no idea how many, or what their disposition would be. He wished that Hermel had followed his initial suggestion of attacking the Black Dragon Inn to begin with, and surrounding the enemy before they themselves were surrounded. Now, with the barn on fire, and no safe escape route, it was too late for that. He wondered if they would survive the ordeal. The two monks from the Bear Claw Village, Moose and Lee, stood up, brushed the hay from their dingy yellow robes calmly, and prepared for whatever may come. Hormel was already dashing towards the fire with another heavy blanket to help extinguish it. In the next stall over, the one below the stairs that went up to the loft, Ishcandar had grabbed Lido’s infamous backpack and was rifling through it looking for his silver brandy flask in the hopes that his friend had thought to pick it up from the street earlier where he’s dropped it. He was not, you might say, in his right mind entirely. For Ishcandar, being without brandy was a kind of worst-case-scenario. He was feeling desperate. “No, no, of course not,” replied the Hobbit earnestly, “but I was hoping beyond hope that you might have stashed my silver decanter in here.” However, it was not meant to be. The silver flask remained where Ishcandar had dropped it outside the barn in the street, unnoticed by anyone in the darkness. 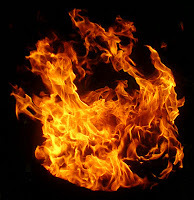 Meanwhile the fire had caught hold on a second bale of hay in the fourth stall; smoke billowed out into the barn filling air with a choking, eye-stinging fume. Yet, as the barn was large, the smoke dispersed into the rafters, and so most everyone was still able to see, and only the archers close to the fire began choking. The barn itself, Hermel thought to himself, was a bit odd, for a mule barn. First off it seemed rather enormous. For second, it was made, like every other building in the town, of large stones mortared together to form very thick and solid walls. The windows where narrow rectangular slits through the stonework that allowed light and air through, but a man could not squeeze himself through it. Nor, he realized to his chagrin, were they particularly good for giving the archers a vantage point from which to fire their arrows the walls were too thick to allow for that. Lastly, he wondered why there were no mules in the barn. It occurred to him then that perhaps the mules had been taken elsewhere before they had shown up a the Inn. And perhaps, as the Brigands controlled the town, and the Black Dragon was the only Inn, they'd planned for this trap from the beginning. This thought irked him considerably. Near the eastern doorway Praymar stood and peered out into the darkness towards the Inn. It was across the wide street, but he could see nothing in the darkness. So he summoned his mystical power of Night Vision, and once the invocation was complete he could see considerably better. It was still, even so, quite dark. Almost unnaturally so, he thought. Out into the street he crept, sliding quietly along the side of the exterior wall of the mule barn running his hand along the cold stones. His Night Vision enabling him to see dimly in a small circle around himself with relative clarity despite the utter darkness outside. Suddenly out of the shadowy night he came upon a large man wearing a yellow robe with a white sash belt looking off in the other direction towards the Inn. The man was half crouched and digging through a pouch for something. Across his knee was a long wooden staff. He didn't notice the quietly approaching albino, and when Praymar saw the man ahead of him, he stopped dead in his tracks and watched him for a moment. “Are you friend or foe?” squeaked Praymar. “Are you kidding?” asked the man whirling around and standing up suddenly, quite surprised. He smiled. “Friend,” he said reassuringly as he began to walk towards Praymar with on hand out stretched, his staff in the other. “From where?” asked Praymar with a squeak. “From across the way,” said the man nodding towards the Black Dragon Inn. None of the lights along the entire street were lit. Even with Praymar’s mystical Night Vision he could barely make out the shape of the Inn. The man continued to approach. “Keep coming towards me and you won’t be happy,” said Praymar holding up his hands in front of himself. The man suddenly whirled with the intent of striking the young albino with his staff, but Praymar was faster. He reached out with his hands and touched the man on his arm, smiling to himself with the anticipation of Draining his hapless foe and stunning him. Then, perhaps, he might enjoy a bit of the old gut-blood, he thought. Nothing happened. The man seemed to have warded it off somehow. He swung his staff without hesitation, a cruel smirk on his face. “I will crush your little albino skull, and split this red beady eyes of yours,” roared the monkish villain. Lido, from inside, heard a crushing sound, and then Praymar's unmistakable squeak, and then the sound of cruel laughter. Praymar staggered into the barn, his left arm dangling limply, blood dripping down his white skin, leaving a trail of dark droplets along the ground. Meanwhile Hermel had been ordering his men to action. Six archers had run to the fire with the heavy blankets and were busy trying to smother the angry flames. The others ran to each of the narrow windows, one of which was located at each of the stalls. They covered every window, but in the confusion one remained unwatched in the far north western corner. Even the stalls, Hermel noted to himself, were unusually thick walled, separated by the same broad stonework as the outer walls. He was certain that this building was not originally intended to be used as a mule barn. It also occurred to him that it was much larger than any mule barn he’d ever seen. It seemed in fact more like a fortress than a barn. It was odd. And rather bothersome. 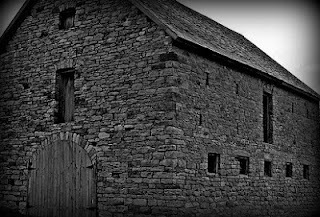 Had it been the typical barn he would have simply ordered Bantum to bash a hole through a wooden wall and escaped that way. Real farmers, he thought, use wooden walls for barns. But these walls were at least two feet thick, maybe more. He glared at one of the walls angrily. Star stared brooding as he looked out the open doorway facing the Black Dragon Inn. It was too difficult to see outside, but within the barn the light from the fire cast flickering shadows against the stonework. Hazy black smoke began to waft over his shoulder. Something was clawing at the edges of his perception. Something blacker than the darkness outside. But he could not comprehend what it was, and as Praymar had just come staggering in, he gave up on trying to sense it, and went to help his wounded comrade. The lad had fallen to one knee about ten feet into the barn. He ran over to help him. No one followed Praymar into the barn. Arik glared at the closed barn doors on the western wall. He thought he could hear the sound of wheels on the cobblestone outside, but he was not sure. It was faint, and the men trying to smother the fire were making a lot of noise with their shouting. Behind him, inside the stone walled room Bantum was calling for Chickenhiemer. Apparently neither the chicken nor the turkey were much interested in answering the gentle giant’s pleas. Arik decided to cast a spell upon himself. It was something that Dwarves were usually not known for, but this was why he had spent so much time studying it. It was in fact a spell of speed. Arik changed and wiggled his stubby fingers in the exact pattern and design he was taught at the Adventure Guild. It worked. Bantum emerged from the dark stone room without Chickenheimer or Turkenator. He had told them to stay put, seeing as how they had shown no inclination to follow him or be caught by him anyway. “You two be good!” he said as he exited into the main part of the barn. Across the way, “Come,” said Ishcandar to Lido, “let’s go help our friend!” And with that they stealthily moved across the barn floor towards where Star was tending to Praymar. Ishcandar absentmindedly, perhaps, had taking Lido’s backpack. Suddenly it rumbled in his hand, and then it belched a short red flame and a billowing cloud of sulfurous smoke ascended to the ceiling. Ishcandar was quite shocked by this. But with the prospect that his silver brandy flask might nevertheless be stashed in there somewhere he was loath to drop the accursed thing. He dragged it along behind him, trying to keep his distance from it as they continued to make their way over to Star and Praymar. The barn was starting to fill with smoke, their eyes starting to burn, and some of the men were actively choking. The men at the fire threw the blankets over sections of it under Hermel's direction, trying their best to smother it piece by piece before the rest of the hay caught on fire. Fortunately, since it had been raining, and everything was a little bit damp, they managed to subdue part of the fire, and were working on the rest. Meanwhile at the windows the rest of the archers kept a keen lookout. No one, however, could see anything through the inky darkness. The smoke made it difficult to see as well and most everyone's eyes were burning. “There’s a huge guy out there," squeaked Praymar as Star finished binding his wound. "He’s bigger than Bantum!” he said. But looking behind him through the doorway, he saw nothing but the dark shadow of night. “Are you done yet?” shouted Bantum into the stone room where Chickenhiemer and Turkenator were busy pecking at base of the north wall. “Cluck, cluck, cluck,” said Chickenhimer. Loosely translated that meant, “Kindly stop interrupting us you gigantic ox!” Bantum's Chickenese was only so good, however, and what he heard was "You are very kind to bother the oxen". Close enough. The men around the fire, now half smothered, began choking seriously from the fumes of blaze. Smoke was lofting into the air and filling the upper airs of the barn. Hermel ordered them to stand firm and continue smothering the blaze with the blankets. Hornmel had by this time run over to provide his assistance. Moose and Lee meanwhile had made their way to where Star was tending Praymar and stood behind him, watching the door to the barn for any signs of movement. Nothing stirred. Apparently the Brigands intended to wait them out. Under the circumstances, thought Moose, it was quite a good plan. With the barn on fire, they would either be overcome by fumes, burned to death, or have to exit through one of the doorways into the line of fire of the awaiting Brigands, however many there were out there. Finally the archers were able to completely smother the fire, though smoke continued to billow from the embers of the haystack. Three of the archers maneuvered to the base of the stairs that lead up to the loft above. It was a wooden loft piled with bales of hay. Moose thought that one spark up there and they’d all be goners soon. How relieved he was when the fire in the mule stall was finally put out. The last of the embers died out as it fell to his feet. He stepped on it for good measure. 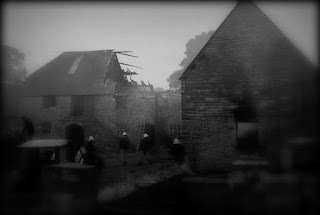 Then, another torch flipped in through the one unguarded window on the far western side of the barn. It landed on a hay stack. "What the hell?" shouted Hermel. "I thought I told you archers to guard all the windows!" They looked at one another sheepishly. It was an oversight. Everyone thought that someone else had gone to that window. "Why I ought to execute one of you to teach the rest a lesson!" shouted Hermel angrily, but not meaning what he said, entirely. Bob, who was the Captain of Dectalion A, felt the greatest pang of regret. This was the second time he'd mismanaged his men. The other Captain looked at him disapprovingly. He might lose his commission over something like this. He swore to himself to make up for it somehow. The hey began to burn below the exposed window. When Arik saw this he ran with truly astounding speed (for a Dwarve) across the room and began stamping on it. “Bantum! Come help me put out this fire!” he shouted. “Ok!” called out Bantum as he ran to where Arik was stomping on the fire. Fortunately, Arik’s ultra fast footwork allowed him to put the fire out before it got out of control. Nevertheless Bantum ran over and began stamping on the smoldering hay just the same. Everyone else stood in silence, and darkness, waiting for the next shoe to drop. It did not take long. Outside the sound of the wagon wheels had grown louder. Suddenly the large wooden doors on the western wall crashed in with a blaze of fire. A large heavy wooden wagon laden with flaming bails of hay smashed through the opening and spewed flaming hay onto the floor. “Bantum! Push that thing back out of here!” shouted Hermel. He thought it would be great to get the large flaming wagon outside as it would illuminate the street and give them a fighting chance to escape. They had, as it was, no inkling as to the forces that might be arrayed against them outside. But he firmly believed that there were archers and Brigands galore, and that furthermore, leaving the barn piecemeal was a certain death sentence. Bantum tried his mighty best to push the wagon. His hand burned, and his shirtsleeves caught on fire. But the wagon would not budge. Through the flames he could see a huge man, roughly about his own size, who was pushing the wagon into the barn from the other side. It was a rather large wagon in fact, the front half of which was piled high with bound bales of burning hay. The huge foe grunted with the strain, and as he and Bantum were equally strong, Bantum could make no progress at reversing the wagon's direction. And he was on fire. So he fell back away from the wagon panting and threw himself to the ground to put out the flames on his cloths. His face was blackened, and hands were burned; the pain was excruciating. The hulking man on the other side of the wagon growled loudly and shoved the wagon further into room. Arik growled at the man on the other side of the wagon. There they were, two grown humanoids, growling loudly at one another like burly animals. "It is the bear vs. the boar, is it not?" queried the Elkron Minvar of her Emperor, but he just folded his hands before his face with two fingers raised to his forehead and smiled grimly without answering. “Get out of the doorway,” said Star to Praymar as he finished binding his wound. Praymar stood up to move, but at that moment, somehow, Praymar was struck by an arrow through the open northern doorway. “Oh for the love of …” cried Praymar as he fell back into Star’s arms. There were in fact archers outside, and by the dim light coming from the flaming wagon on the other side of the barn, one of them got a lucky shot and wounded the white haired serpent-child. Lido, who also happen to be standing in the line of fire of the open door, deftly stepped out of the way and dodged into a shadow. Four arrows plunked into the stairs where he had just been standing. He wiped his forehead with the back of his sleeve and sighed with relief, and then ran through the flickering shadows towards where Ishcandar was standing, behind Star. “It might be time to abandon the western side of the barn,” said Star as he watched the barn doors catch on fire and flames begin to climb toward the wooden rafters, sparks flying high into the dark shadows above. It seemed evident that the hungry flames would soon reach the loft if not checked. Star, although deeply concerned about this, began tending to the arrow sticking out of Praymar’s left leg. “Archers!” shouted Hermel. “Face the flaming doorway in the Six Brick Formation and prepare to fire!” He expected the man pushing the cart to barge his way into the barn and begin wrecking havoc. There was no way Hermel would let that happen. He knocked an arrow with his bow, his green cape fluttering in the wind that was wafting in the updraft caused by the wagon fire and stared menacingly at the western doorway. His expression was grim and determined. The men jostled into the double-row formation, knocked their bows, kneeled down, and prepared to fire. Ishcandar, still holding Lido’s bag, felt the cursed thing rumble again, and another belch of short red fire and a sulfurous plume of smoke lofted from its mouth into the air. With that he decided he had had quite enough of the backpack to hell, and threw it outside the barn onto the dark street. “May the devils of hell plague those damn Brigands!” he said vehemently under his breath. Star was just finishing binding Praymar’s arrow wound while the burning wagon on the other side of the barn jammed into the stone wall of a stall and came to a sudden thunderous halt, sending flames blazing upward; sparks ascended high into the rafters. Billows of black and green smoke billowed upward toward the ceiling. Arik and Bantum stepped back shielding their faces from the heat. The archers, who were poised to shoot their arrows, had no opportunity. The huge Brigand who pushed the cart, and wedged it firmly into the doorway, never entered the barn. Hermel scanned the upper loft, looking for any avenue of escape. As far as he could see there were no doors up there, nor windows. Just large bales of hay, and a few barrels. He looked to the dark northern doorway toward the Black Dragon Inn. He imagined that villain, whom he now knew was the very Brigand Chief who had kidnapped his sister and the other villagers of Yellow Clay, smirking, gloating with pleasure in some hidden alcove nearby. He was furious, but their options had been whittled down to a regrettable few, and there was nothing to do about that. He would just have to make the best of things. As he, and the others who followed his gaze, looked in the direction of the northern doorway, they all noticed the other double doors that had been closed the entire time on the eastern wall slowly open as though by themselves, the bolt that held them shut falling to the ground with a thud that echoed somberly throughout the barn. The hairs raised on everyone’s necks. Beyond those doors was the room where the Cartwright workshop was located. They’d passed it on the way into the barn, but had taken no particular notice of it. It was a wooden building attached to the side of the stone barn. It had a set of double doors that faced into the mule barn, and another set that faced onto the street. As both sets of doors had been closed, no one had bothered to venture to take a look inside. But now the doors slowly opened of their own accord. Beyond them was an inky blackness, darker than the pitch black of night outside. Far darker. Within, Praymar felt, more than saw, some dread figure standing with two hands outstretched towards him. Suddenly a gust of wind blew into the barn. It was hot, and smelled of sulfur. On that gust a sheet of yellow paper came fluttering in from the darkness. It lofted in the air, floating, pirouetting, flipping and fluttering past Ishcandar who tried to catch it, until it landed directly on the square Praymar’s back. And there it adhered itself, as though glued to him. The bright red letters almost seemed to glow line the dim light coming from the blazing wagon on the far side of the mule barn. “Come to me, Praymar,” a deep resonant voice spoke in the hidden recesses of his mind. He shuddered. No one heard the sound of that fell tone. But everyone felt it just the same. It was as if an icy wind swept through them all, baring their souls to the realities beyond the world of warmth and light. The infinitely dark realities of the world of the damned.